K.P. Singh regularly contributes essays to Sikhpoint.com. Many of his articles can also be viewed under the heading "At Home in the Heartland," at NRIinternet.com. More information about K.P. can been found in the Who's Who section of the NRIinternet website. In the past, K.P. authored essays in the IN Touch section of the Indianapolis Star (March 2004 - November 2005). The following essay originally appeared on the NRI Internet website. Photos from KP’s recent exhibit opening may also be found on the NRI Internet site. The Opening Reception of “KP Singh in Color – Selected Drawings and Prints” at the Indianapolis Art Center attracted an enthusiastic multi-generational and multicultural festive gathering with over 200 art patrons and friends, artists, media personnel, writers, and musicians; business, faith, and community leaders. Many of them contribute immeasurably to the culture and international spirit of Indiana. We were especially grateful for the presence of Honorable Diego Morales, Special Assistant to Indiana Governor Mike Pence; Jane Gehlhausen, Director of Cultural and International Affairs in the office of Indianapolis Mayor Greg Ballard; Charlie Wiles, Director of Center for Interfaith Cooperation; Julia Moore, Director of Public Art in the Indianapolis Arts Council; Jennifer Pace Robinson, Vice President of Exhibits and Family Education at the Children’s Museum of Indianapolis; Maninder Singh Walia, President of the Sikh Satsang of Indianapolis; Rupal Thanawala, President of Asian American Alliance; Rev. Richard Hamilton, a distinguished spiritual leader; Anita Lerche, Danish Punjabi singer-songwriter; John Mallon, Owner and Founder of Editions Limited, the most prestigious art gallery in Indiana; Patrick Flaherty, President of the Indianapolis Art Center and many others. The Exhibit at the Indianapolis Art Center turned out to be a gathering of many friends and people who enjoy the arts; initiate, sponsor, support, and strive to enhance the cultural, spiritual, and treasured assets of a community. The Opening Reception, in that sense, became a celebration of the arts – with the KP Singh drawing and prints of landmarks from around the world, fabulous harp music, food, photographers, writers, other Art Center exhibits, dedicated patrons and passionate art advocates that enjoy and make the arts an important part of community fabric and spirit, a major national priority. The following excerpt is from an essay by Chi Sherman that originally appeared on the Sky Blue Window website. You may view the entire article. Internationally known illustrator K.P. Singh speaks with an elegance and cadence that turn his words into a dance. His designations include artist, advocate, author and public speaker and could easily welcome storyteller. Listening to him talk about his 50-year journey from his native India to the United States feels like stepping into a Jhumpa Lahiri novel. 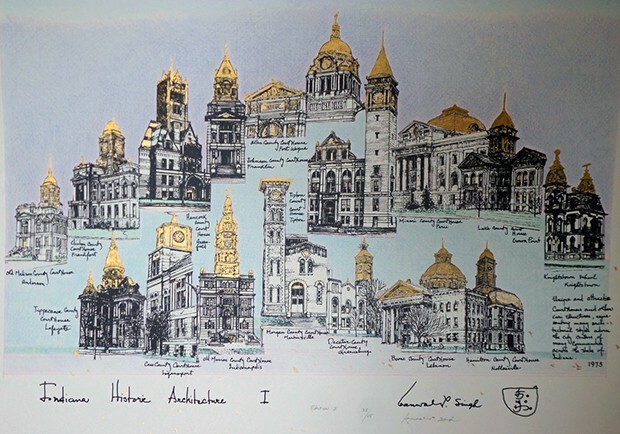 As finely as he composes his pen-and-ink drawings of historic architecture and monuments, so does he detail a life bolstered by art and his Sikh faith. In 1965 Singh arrived in Ann Arbor where he pursued a degree in city planning at the University of Michigan. He had already attained degrees from Punjab University and The Indian Institute of Technology, and he came to the States in to spend time abroad before settling down. Though he returned to India for a formal ceremony celebrating his first marriage, he made Indiana his home in 1967. Following the completion of his degree, Singh moved to Indianapolis and joined the Department of Metropolitan Development as a senior designer and urban planner. Here he held that position from 1967 to 1972, at which point he created his own fine arts enterprise, K.P. Singh Designs. Though his training was not in art, drawing had been a component of his studies in planning and architecture in India and Michigan. His work in Indy revealed an ugly truth: A number of historic buildings were being demolished to make room for more parking lots. “Having been surrounded by so much beauty and historic things in India, I wanted to convey as a planner and an artist that we as a civilization could not afford to destroy these landmarks,” he says. “They had artistic architectural value.” He explained that the buildings’ facades, skylights, stained glass and designs had been inspired by other countries and cultures. “If I showed in drawings how beautiful these buildings were, it would draw attention. An image is worth a thousand words,” he says. View the entire article by Chi Sherman. Over the past 30 years, a center of Tibetan culture has been taking shape on an 80-acre wooded site amidst the rolling hills of Southern Indiana near I.U. Bloomington. This dream to preserve and introduce Tibetan Buddhist spirituality and culture to the West has been in no small part due to the tireless efforts, dedication, and inspired vision of the late Professor Thubten Jigme Norbu (Tagtser Rinpoche), the elder brother of His Holiness the Dalai Lama. Dr. Norbu migrated to the U.S. in 1950 and later settled in Bloomington, Indiana. 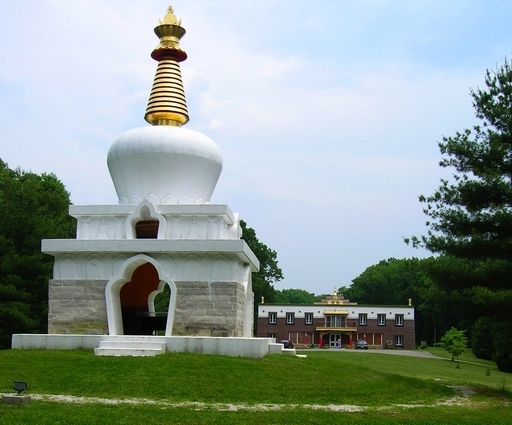 The Tibetan Cultural Center in Bloomington, re-named The Tibetan Mongolian Buddhist Cultural Center (TMBCC) in 2006 by His Holiness the 14th Dalai Lama (Tenzin Gyatso) who has visited Indiana five times since 1987. Dalai Lama is the Spiritual Leader of the Tibetan Buddhism and is the former Ruler of Tibet who has been living in exile in India since 1959 when he fled his Homeland in the face of Chinese invasion and occupation of his country. While the world has looked the other way, the brutal suppression of Tibetan people in their Homeland and destruction of their ancient culture has continued to this day. The last five decades have seen an unprecedented influx of people from around the world and a large number of them from countries in the vast Asian Continent that today houses nearly half of the world’s population of over six billion people and two emerging superpowers, China and India, into the United States of America. We have witnessed a significant share of these Asian immigrants converging into the American Heartland in search of their dreams and opportunities. 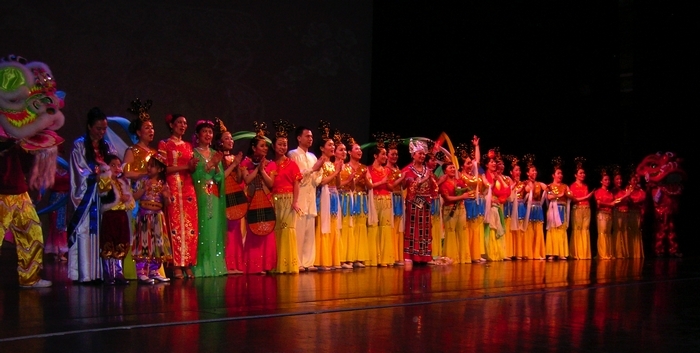 These immigrants represent many unique talents, rich cultural heritage and, a strong will to strive and excel in lands and places that are their new home. These newcomers, until recently, remained unusually quiet; the full measure of their talents untapped. They are finally coming into the community mainstream and national spotlight as a population, exploring the power and potential of their ideas, passions, and proudly affirming their deep commitment to American ideals. At the same time, these recent arrivals to our shores remain excited about the deeply enshrined cultural associations and ancient traditions of their native lands, and are passionately engaged in creating private, public, and cross-cultural activities, opportunities, and environment for their preservation and continuation to benefit the future generations of Americans. Cities are promoting diversity as an attraction, a destination. Media, internet, and inter-continental travel is frequently spotlighting and introducing us to Asia as a Continent of incredible richness, diversity, and wonderful surprises. The 2008 Spirit & Place Festival theme: “Exploring Imagination” is truly thought provoking. As I see it, the theme invites and celebrates our efforts and resolve in transforming ordinary and extraordinary, imagined and perceived ideas, and cherished hopes and dreams into visions of reality. As living-breathing and thinking beings, we carry special hopes, dreams, and expectations that best reflect our times, interests, talents, and commitments to improve our personal and collective human condition. We wonder, examine, and interpret the meaning, intricate mysteries and interrelationships, and the boundless promise of life. We see life as a colorful and complex tapestry of thoughts, emotions, ideas, and raw images of dreams and possibilities. We see life as a many-faceted living prism, teeming with and unfolding many ideas and images that dazzle our mind and attention. Our study, meditations, and reflections inspire us to give shape to ideas that capture our imagination.